In the third layer of this image, I went mostly monochromatic. There are colors weaving through, but they have been knocked down with touches of burnt sienna, yellow ochre, and sepia. The intense middle layer adds some further color variation, unfortunately this layer obscured more than I had intended. 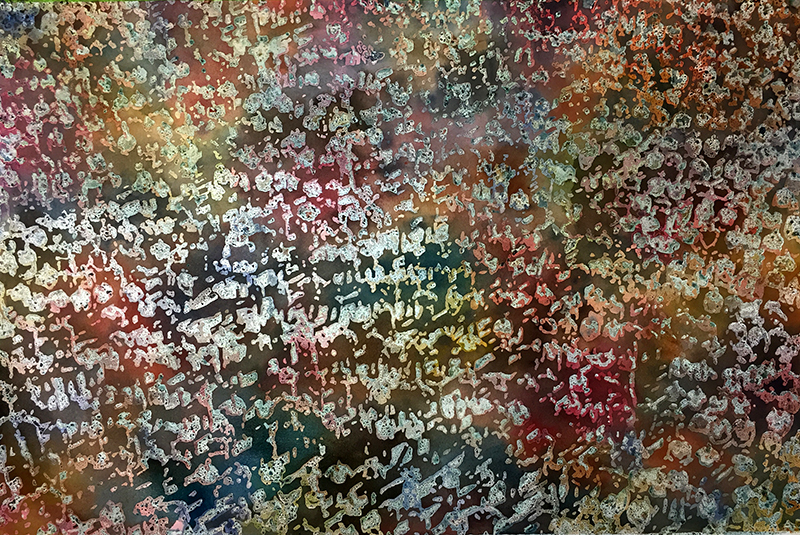 The last layer is the opportunity to lock in chaotic color movement. It provides lots of latitude in the earlier stages when the last touches will sync it all together. It takes a daft touch. Too little and syncing doesn’t happen, in fact it only adds to the cacophony. Too much obscures previous layers and flattens the image. Just right and it’s a thing of beauty. That didn’t happen ere unfortunately. The final wash was too heavy and opaque, resulting in a very monochromatic image with little variation. It was not a failure however. 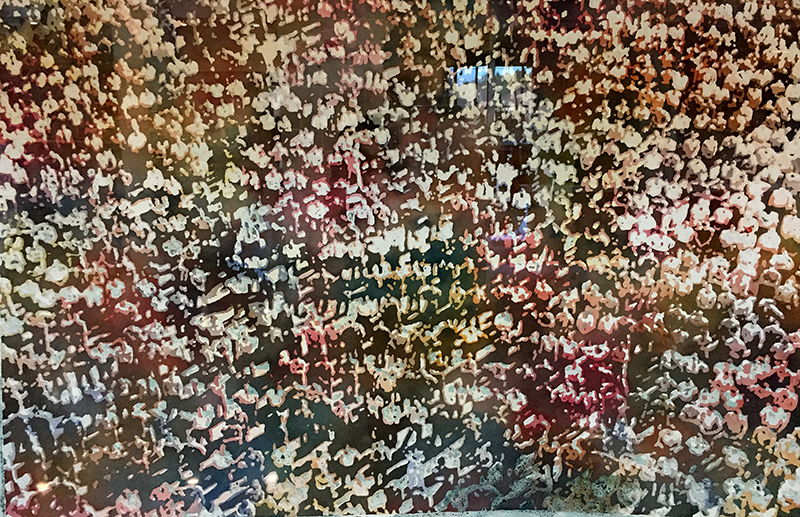 The spectator image expanded to 3′ x 4.5′ has a presence to it unlike any others using this subject matter. Logistically, each layer involves the same process as the first; an additional layer of masking followed by a new layer of watercolor. With each layer, the image will become more defined and darker. Those are a given. Otherwise there is flexibility and leaves room for variation. In this case, the second layer I blasted with intense color to counter the pastel underlay, which should create a smooth color blend. I also plan to tone the intensity down dramatically in the next layer with a more monochrome palette, so the intensity will take a big hit. If I kept the intensity low here, the final palette would probably be flatter than I want.